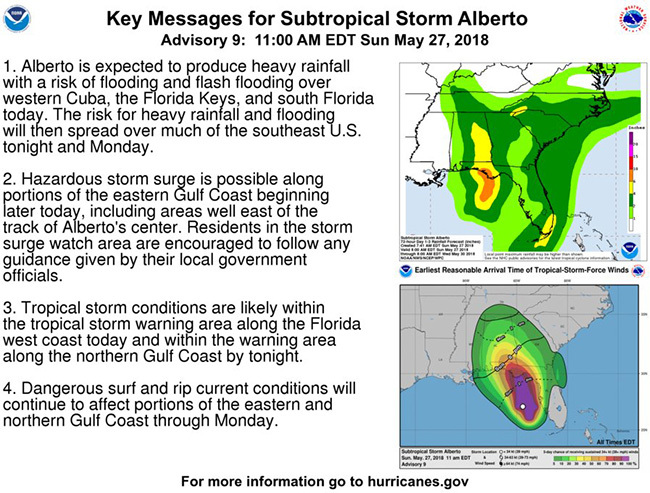 WASHINGTON, May 27, 2018 - The U.S. Department of Agriculture’s (USDA) Food Safety and Inspection Service (FSIS) is issuing food safety recommendations for those who may be impacted by Subtropical Storm Alberto. The National Hurricane Center expects Alberto to move over the northern Gulf of Mexico tonight and approach the northern Gulf Coast area by Monday, bringing heavy rainfall and sustained winds of up to 50 mph to Louisiana, Mississippi, Alabama, western Tennessee and the western Florida Panhandle. Tropical storms present the possibility of power outages and flooding that can compromise the safety of stored food. Residents in the path of this storm should pay close attention to the forecast. FSIS recommends that consumers take the following steps to reduce food waste and the risk of foodborne illness during this and other severe weather events. • Use dry or block ice to keep the refrigerator as cold as possible during an extended power outage. • Fifty pounds of dry ice should keep a fully-stocked 18-cubic-feet freezer cold for two days. FSIS will provide relevant food safety information as the storm progresses on Twitter @USDAFoodSafety. If you have questions about food safety during severe weather, or any other food safety topics, call the USDA Meat & Poultry Hotline you may chat live with a food safety specialist at AskKaren.gov. These services are available in English and Spanish from 10 a.m. to 6 p.m. Eastern Time, Monday through Friday. Answers to frequently asked questions can also be found 24/7 at AskKaren.gov.